I am just coming back from a visit to my homeland, Switzerland and I am reminded that today, August 1, marks the Swiss National Holiday when Switzerland commemorates the foundation of the Swiss confederation in 1291. The original pact that bound the first three Swiss cantons (small states or provinces) represented an agreement between them based on mutual protection and a principle of non-aggression. Since then, Switzerland has grown to become of confederation of 26 cantons and has now an official Constitution. As Albert Blaustein suggests, “The U.S. Constitution is our most important export. From its very inception, its influence has been felt throughout the world. And even where that influence has not resulted in democracy and freedom, it has still brought hope –in Lincoln’s words—of a government of, by, and for the people.” For those who study the history of American constitutionalism, this is a known fact. What is perhaps less known (and more controversial) is the possible influence of the Iroquois people on the Founding Fathers and their vision of democracy that was translated into the American Constitution. The Iroquois people are approximately 125,000 today and live between Ontario in Canada and the Northern region of the U.S., especially Wisconsin. Historically however, the Iroquois nation was occupying a large portion of the North American continent, spreading between the State of New York and the territory around the Saint-Laurent river. Organized in a federation of five tribes (that grew to six tribes in the 18th century, including the Mohawk, Onondaga, Oneida, Cayuga, Seneca, and Tuscarora peoples), they were powerful. Known as the Great Law of Peace, the text that sealed their agreement is considered by some historians as the very first model of a constitutional democracy. The document was reconstructed in 1916, based on an oral tradition going back to the 16th century. Even if Congress eventually agreed to recognize the influence of the Iroquois people on the U.S. political system in its 1988 Resolution, such a view, as one can imagine, has been met with much debate. This debate, ultimately, questions the origins of the democratic ideals. In the narrative regarding the birth of the Western democracy and its constitutional model, the U.S. play a significant role and is credited by many for being the “prime mover” of democratic values. The Christian identity of the U.S. (as well as other Western democracies) is often invoked to explain the religious inspiration of such democratic ideals. Once the narrative changes and we recognize the influence that the Iroquois Confederacy may have had on our Western democracy, the Christian impact on it is indirectly put into question as well. The Iroquois document simply speaks of the Tree of Great Peace, planted and cared for by each nation. A few years ago, I was attending a conference where a speaker was arguing for the direct debt that the U.S. Constitution had vis-à-vis the Iroquois Great Law of Peace; in order to make his point, he mentioned the statue that stands on top of the American Capitol in Washington as a proof of this influence. I got curious and investigated the origin of this statue that I had never noticed or heard of. 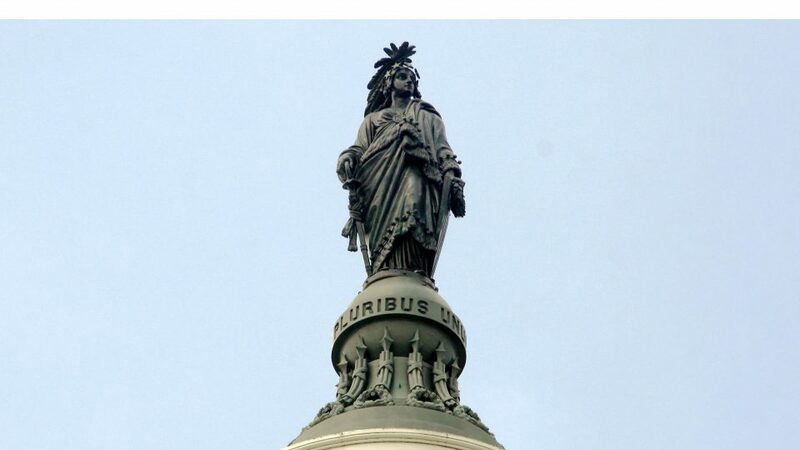 The name of the statue is in fact the Statue of Freedom; it was commissioned to the American sculptor, Thomas Crawford (1814-1857) in 1855 and installed on top of the Capitol in 1863. Strangely enough, however, the statue breaks away from other traditional allegorical representations of freedom and wears an unusual headdress with an eagle. In a letter from 1856, Thomas Crawford explained that his choice to put a helmet with a crest composed of “an eagle’s head and a bold arrangement of feathers” was indeed inspired by “the costume of our Indian tribes.” Today, for those who are defending the influence of the Iroquois Confederacy on the American Constitution, Crawford’s statue is read a tribute to them. I like, for myself, the political and historical connection between my country of birth and my country of adoption; it gives some continuity to my own story. The connection with the Iroquois Confederacy expands this continuity and makes me revisit both lands with different eyes, those of the wanderer who needs to learn about all the roots of the past in order to be faithful to the present.